A two-time all-conference pick at both center and linebacker for Louisiana Tech, an all-America selection in 1950, and a linebacker on the mythical all-Louisiana First 100 years of Football team, Leo Sanford recently established an endowed scholarship, the largest in Tech Athletics history, to be awarded annually to a deserving student-athlete. “I’ll be happy to have given the second-largest endowed scholarship if one of you other guys would step up,” Sanford said recently at the breakfast that an unofficial club of friends enjoy each Friday in Shreveport at Southfield Grill. 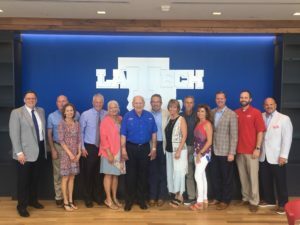 President Les Guice recently held a lunch reception to honor the Tech Athletics Hall of Famer and Louisiana Sports Hall of Famer in the Chris Richardson Family Suite Level at Joe Aillet Stadium, which sees its 51st season of football begin Sept. 8 when the Bulldogs host Southern in Tech’s 2018 home opener. The scholarship will reach all teams in Tech’s athletics department, not just football. Sanford hopes the scholarship will help an athlete who loves the game, needs the financial assistance, and is willing to persevere, which is something he knows a little about: In 1943, when he was a sophomore at Shreveport’s Fair Park High, Sanford was one of only four players on the Fair Park football squad who didn’t get game uniforms. Fifteen years later, he was wrapping up an 8-year NFL career in Yankee Stadium in “the greatest game ever played,” Sanford’s and Baltimore’s overtime victory over the New York Giants. Such a gift as this endowed scholarship is not out of the ordinary for Sanford. Bobby Aillet, a Tech teammate for two years with Sanford, has been close friends with him since, and the two families they formed grew up together and often traveled together. “He wouldn’t fit the mold of most of today’s linemen,” said Aillet, who retired from NCAA football officiating as one of the game’s most respected referees. “He is a very gentle man but a very hard-working linebacker. None of that ugly stuff, nasty stuff; he was strictly about tending to his business. Curt Joiner, one of Leo’s son-in-laws, will tell you it’s a “good” kind of crazy. “I don’t know if there’s any guy in the world I enjoy spending an evening with more than my father-in-law,” Joiner said. The Sanfords, for decades a fixture at all sorts of Tech events, invested in each other and in the University, but also deeply in friendships. The weekly Friday breakfast group was started by former Tech football player and Fair Park High coach, the late Clem Henderson, with 47 present 10 years ago. Time has marched own, but a few of the longtime friends are still able to gather: Sanford and fellow former Bulldogs Aillet and Charlie Glover, former Arkansas hoops star Leo McDonald from Many, Tech supporters Glenn Price and Joe Roach, and the only LSU Tiger in the bunch, Jack Daniel. Tech’s student-athletes have continued to increase their success in the classroom over the past decade. In the NCAA’s most recent Academic Progress Rates (APR) released in May, all 16 of Louisiana Tech’s Division I sanctioned programs remained penalty-free, and two programs recorded historical bests in their multi-year scores. Women’s soccer and softball both recorded their highest multi-year rates at 984 and 987, respectively, while baseball, football, men’s golf, women’s basketball and women’s cross country joined them with an increase in their scores from the previous year. Tech also posted its highest multi-year average of 965.4, besting last year’s 963.0 by 2.5 points. It marks the eighth time in the last nine years that LA Tech has boasted an average of 960 or higher on its multi-year rate.